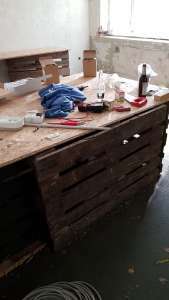 Together with the Recons we continued working on various stuff in Plessa between 13 and 14th July. After Installation of our 1.2 KWP Solar System earlier this year and preperation to bring power to the Main Entrance Building we started the electric installation in said building. In addition the Recons added additional various vandalism protection mechanisms to some windows after various break in attempts. Electricity in the Main Building will allow players to see something when its get darker in the cold time of the year and also to have the ability to charge batteries for there weapons and radios or even some mobile phones. 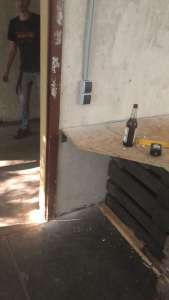 You will find at least one light and a power socket in the rooms on the left side of the building which are equipped with OSB3 self made tables. Kontoinhaber Airsoft Verein Recon EE e.V. Anything will help. Thank you! We also work on various improvements to the gaming ability on the field aswell, some of them which are extremly unique in Airsoft. We will add some posts later about our WiPs for those systems.